Over the last several years I have shared information with friends regarding carseats such as their proper use and what carseats I use. Rather than continue to make comments every time the subject comes up, I decided to write a blog post that I could share, saving me time from writing these details out each time someone asks. Hopefully, this will be useful to someone and will save them time researching. I like to use an infant carseat when my children are infants instead of a convertible carseat. I like to be able to fasten my baby into the carseat while inside the house where it is not too hot or cold, like it often is in the car. I also like to be able to take my baby in or out of the car without waking him up to get him out of the car. Often times he will fall asleep just before we get somewhere, so being able to carry the carseat in and allow him to continue sleeping is something I like to be able to do. I also am thankful to have the carseat when out and about if I need to lay him down for some reason such as when he wants to take a nap. Many people I know like to skip the infant seat and go right to the rear facing convertible carseat. They like to be able to take the baby in and out of the car and carry the baby in a sling or carrier and not have to worry about carrying a carseat around. I also like do this on occasion when the situation calls for it, but I can still do that with the infant seat just by leaving it in the car. 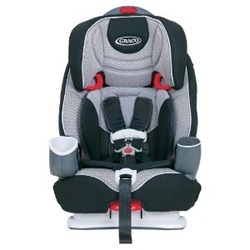 It is an added expense to buy an infant seat, but if look, can often be found for $70 or less. Everyone has to make the decision that works best for their family. Regardless of which type of rear facing seat, an important requirement is for the shoulder strap slot should to be just below the child's shoulders. If it is not, the straps needs moved or you need to change to a new seat that fits the child. I used a Graco's infant seat, but any infant seat will work so I won't bother recommending one. If the baby is bigger, look for one with a higher weight limit. Besides that, just go to the store and test some out to see if any feel better to carry. Some may be lighter weight, which is a plus. Avoid buying a used carseat from a stranger since it could not be proved it is accident free. Once a carseat has been in an accident, it needs to meet specific requirements for it to still be safe. It would not be able to meet these requirements if the seats history is unknown. At some point after a year, I switch to a convertible carseat. 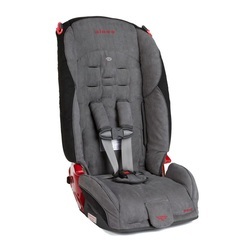 The one I use is the Sunshine Kids Radian 65 which is now the Diono Radian R100 Convertible Carseat. I still keep baby in the back facing position because it is still the safest position. It is now recommend to keep back facing till at least 2 years old, but I like to keep my kids back facing closer to 3 years old. I may even keep my last child in the rear facing longer if I can. When I do finally switch my child to forward facing, I have to make sure I move the straps so that they are above or at my child's shoulder height. In this forward facing position, they should not be below the child's shoulders. If they are, the straps need moved or the child will need a new seat that fits their height. I have heard several people comment about keeping a baby rear facing longer if the child wasn't so big. If it is an infant seat or a convertible carseat that has a large enough weight limit, most children should have no problem sitting rear facing. It may seem that the legs don't fit, but the child will find some where to put their legs and feet. The following video talks about what can happen to a child who is placed in a forward facing carseat before their body is able to handle the force of a crash. If also has video showing a crash test with a front facing carseat vs a rear facing carseat to get an idea of what will happen in a crash situation. When my child's shoulders get higher than the highest slot for the shoulder straps in the Radian, I switch to a 5-point harness booster seat. The one I use is the Graco Nautilus 3-in-1 Car Seat. The Nautilus is not a rear facing carseat, so that is why I do not use it directly after using the infant seat. The Nautilus will fit a child up to 65lbs with the 5-point harness (like the Radian) but it has a higher strap height than the Radian. My son still fits in it at 9 years old using the 5-point harness. 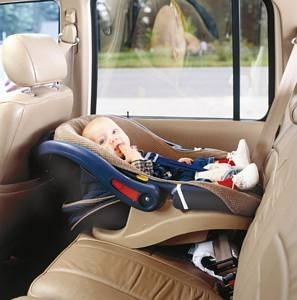 It can also convert to a high back booster using the car seat belt or it can be a backless booster for older children who need help getting high enough for the seat belt to fit properly. Many booster seats only go up to 40 lbs. Others don't have the 5-point harness and require use of the seat belt. The following video shows a crash test with a 5-point harness carseat and a high back booster using the car seat belt. It shows that the seat belt doesn't do the best job of holding the child in place during a crash. Therefore, I choose to use a 5-point harness for our everyday booster seat and I will use it as long as he will fit in it. There are several questions that come up about how to properly install a carseat and how to use it properly. Since all seats and cars are different, reading the manual on the carseat is the first place to start. There may be some place in the area that will install it and demonstate how to do it. When I install a carseat, just before I tighten it, I like to sit in it and as I am pulling to tighten it, I lean left and right and wiggle while I pull tight. This gets a really tight fit. Additional to this, most carseats will benefit from fastening the teether that comes attached to the top of the back of the seat. I fasten the teether even when my carseat is in rear facing position. Directions for this can be found in the carseat manual. This teether just adds an extra point to keep your carseat in place. An important tip is to be sure the child is not wearing a thick winter coat. When compressed in an accident, a winter coat will leave a gap between the child and the carseat which may leave room for the child to fly out of the seat. My kids either wear a thin jacket or no jacket, even in the winter. They either cover up with a winter coat or with a blanket to keep warm if they are not wearing a jacket. My baby gets to have a blanket to keep warm. It is also recommended not to use any product that did not come with the carseat that would lay between your child and either the back of the seat or the straps. So, if the necks straps were not tested specifically with the carseat, then they should not be used with the carseat. The same goes for any padding that can be found to try to make the carseat more comfortable. If it didn't come with the seat, don't use it. Another tip is to make sure the chest clip is at armpit level. I often see babies in their seats with the clip so far down that the baby would be able to fly out in an accident. Or sometimes the straps are not completely over the shoulders which could allow the baby to be ejected. The straps also need to be pulled tight enough not to allow slack where baby could slip out. Therefore, the straps should not be able to be pinched. If they can be, the seat should be tightened. One more point to know about carseats, is that they do expire after the time noted by the manufacturer. Some carseats have longer expiration times than others. The 2 seats I use have longer expiration dates than most other seats. The Radian is 8 years and the Nautilus is 10 years, while most others are only 6 years. I wanted to be able to use my seats for multiple children, so the longer expiration time was a plus on the seats that I chose. Some people may wonder why a carseat would have an expiration date. The following video shows a crash test using an expired car seat. It shows how the straps broke through the plastic on the back and allowed the child to come forward away from the seat. Included in this video is other information about the proper use of a carseat. I wanted to say one last thing regarding carseats and their recommendations and laws that are made to keep kids safe. These laws are generally the minimal requirements to try to get people to keep their kids safe. In Illinoisb the law says to keep a child in a booster till they are 8 years old. That does not mean that automatically at 8yo, a child will be able to fit in an adult seat properly. The important thing to remember is keeping the child safe, so if the adult seat belt does not come across the child in the correct place across the chest, then the child still needs some sort of booster seat even if he is 12 years old. I hope this has been helpful. I will answer questions that are left in the comments. You can view The Greater Good Movie free on the Mercola.com till Nov. 5. "THE GREATER GOOD looks behind the fear, hype and politics that have polarized the vaccine debate in America today. The film re-frames the emotionally charged issue and offers, for the first time, the opportunity for a rational and scientific discussion on how to create a safer and more effective vaccine program. From October 30th through November 5th, Dr. Joseph Mercola and the National Vaccine Information Center (NVIC) are teaming up to present Vaccine Awareness Week. In addition to all new articles on vaccine topics and never-before-seen video profiles of the vaccine injured and their families interviewed by NVIC’s co-founder and president Barbara Loe Fisher, the week will also feature an exclusive, free, online viewing of THE GREATER GOOD (84 minutes). A special limited edition DVD of the film will also be available for sale on Mercola.com starting 10/30 for just $10." I just added an article to my vaccine webpage that details how I came to to have the views I do on vaccines. Check out My Vaccine Journey. In his article titled The Great Cancer Hoax Part II: The Brilliant Cure the FDA Tried Their Best to Shut Down... Dr. Mercola is talking about how natural treatments for cancer are not given any credit by those who decide on what are the best cancer treatments. There is no money to be made by the cancer industry for solutions that they can't patent, so they ignore these with the help of our FDA. Take a look at what he has to say about all this. He posted the following video with his article. You can either view it directly from there or I have attached it here for convenience. I haven't had time to view it yet, but it tells the story of a family who decides to go against the mainstream treatment for their son and how they are forced to do it anyway. I think the video may only be available for free for a short time, so if you plan on viewing it, you may want to do it sooner than later. Cut Poison Burn from Nehst Studios on Vimeo. Over and over I have seen how natural treatments (many different kinds) have worked for different people to rid there bodies of cancer. If those looking to solve the cancer problem in this country would take the time to examine these cases, they may learn some valuable information which could not only help people heal from cancer, but to actually stop them from getting it in the first place. I can't see that happening anytime soon. It will be up to the people, as it usually is, to change this around. Sharing this sort of information is just one of those steps in the right direction so that at least people can be aware that there are other treatments to try besides chemo, drugs, and radiation. Dr. Patrick Barnes is interviewed with his current views on shaken baby syndrome. He was a doctor who testified for the prosecution in the Louise Woodward case back in 1997. His views have since changed as new information is learned about shaken baby syndrome. "THE GREATER GOOD looks behind the fear, hype and politics that have polarized the vaccine debate in America today. The film re-frames the emotionally charged issue and offers, for the first time, the opportunity for a rational and scientific discussion on how to create a safer and more effective vaccine program." I sent an email to our local theater that shows independent films to see if they will be able to get it there.